1 Pic 1 Word is a free puzzle game app for Windows 8 and 8.1 in which you have to guess the picture shown on the screen. The catch of the game is that the picture that is shown to you will not be displayed fully, and only a small section will be shown. You have to guess what the picture is and select the letters from the jumbled grid to form a meaningful word which corresponds to the picture. For instance, if you think that the picture shown is that of a cat, click on the letter C, A, T from the grid and click Enter, and you will get in game currency and some points as well. If your guess is correct, you will be shown the complete image of which the section was shown to you when you guessed it. 1 Pic 1 Word is available for free from the Windows App Store. When you install and launch the 1 Pic 1 Word app on your Windows 8 or 8.1 device, you will be presented with a screen wherein you will be shown the options which you can see in the below screenshot. When you click on the How To Play button, you will be presented with the brief instructions as to how you have to play the game. These are basically the rules of the game which you have to keep in mind when you are playing the game. You can read them in the screenshot below if you want a detailed explanation of how you have to play the game. You can go back to the main screen of the game by clicking on the back button at the top left of the screen. Once you are back in the main menu, you can now choose to start the game. When you start the game by clicking on the Play button, you will be presented with the gameplay screen as you can see below. 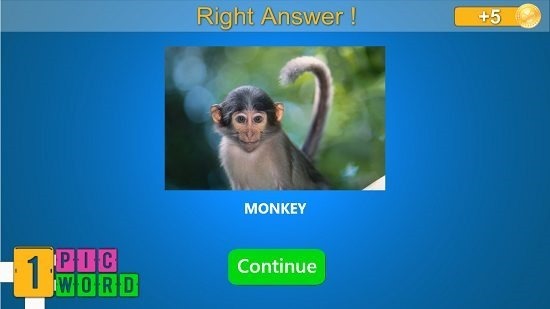 As you can see above, I have already guessed 5 letters by looking at the pic, and it’s fairly obvious now that the name of the animal whose section you can see is that of a monkey. So when I typed the last letter Y and clicked on Enter, I was presented with the below shown screen. So you can see that the picture was indeed that of a monkey. You can click on the Continue button at the bottom of the screen to be presented with the next question. 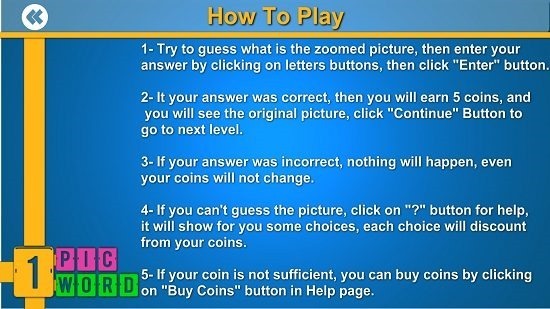 Do note that each question increases in difficulty as you progress through the game. 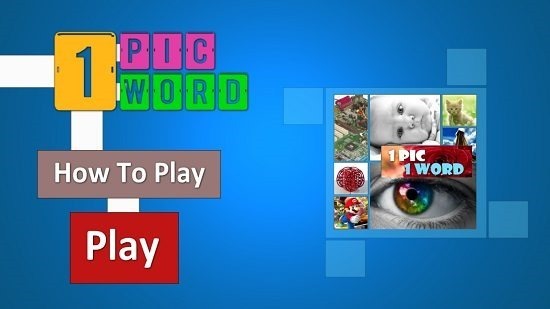 You can also read more about the 4 Pics 1 Word and Amazing Mazes apps for Windows 8 and 8.1. 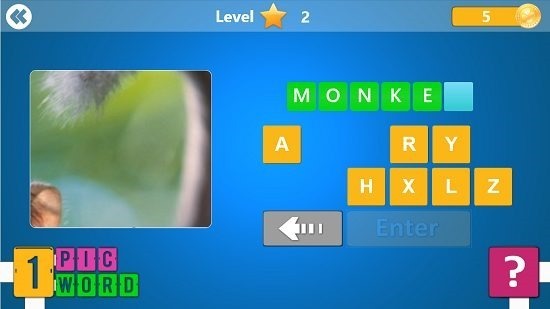 1 Pic 1 Word is a very well designed puzzle game app for Windows 8 and 8.1 which tests your wits in a way which is very powerful as well as intriguing at the same time. It is the test of your visual and neurological skills combined and hence this app makes for a great download for any Windows 8 device! Get 1 Pic 1 Word.